An Empowering Prayer: Thank You! Thanksgiving is a season of brotherhood and generosity providing a time for reflection and perspective. I would like to take this opportunity to say THANK YOU! Thank you for your time, energy, caring, leadership, and focus on creating a better quality of life for communities throughout Los Angeles. The question is often asked: What are you grateful for? It is such a simple but potentially powerful question. I invite you to take a moment with me to consider what you are grateful for. Is it health, family, mobility, or the gift of the challenges that face us? When gratitude is present, powerlessness and poverty subside. You need not be religious or spiritual, but I hope you’ll take part in this most empowering prayer of gratitude. 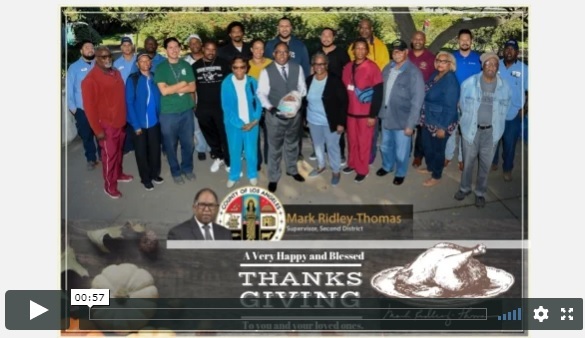 http://ridley-thomas.lacounty.gov/wp-content/uploads/2018/11/tn.jpg 338 585 admin http://ridley-thomas.lacounty.gov/wp-content/uploads/2017/12/MRT-Banner_nonChairman.png admin2018-11-19 14:54:072018-11-19 15:15:40An Empowering Prayer: Thank You!